The reviewer has been compensated in the form of a Best Buy Gift Card for this post, ENERGY STAR Washer & Dryer at Best Buy, and all opinions are my own. I remember when we bought our first ENERGY STAR® washer and dryer. It had been on my list for a long time and when we headed to the store to make our purchase I had a list of ‘wants’ I wanted the appliances to be able to do. ENERGY STAR was at the top. Guess where we buy most of our appliances? At Best Buy! I can research first online at their website, reading reviews and comparing features, then head in store to see the models before I buy and ask questions in person. Best Buy is committed to impacting the environment positively and carry a great range of energy efficient products, which is important to me. Why does ENERGY STAR matter you ask? Not only is ENERGY STAR better for the environment, but it saves you money as you using less energy and water. Just switching out your washer will save you over $490 in its lifetime, but wonder if you swapped out the dryer too? More saved! Also you might not realize that the washers use a variety of sophisticated cleaning methods that are gentler on your clothes and the dryers use less heat and sensor drying which reduces wear and tear on clothes from over drying. Your clothes last longer! So many reasons to buy a new laundry system with that little logo. Learn more about ENERGY STAR with a cute video on the Best Buy blog. 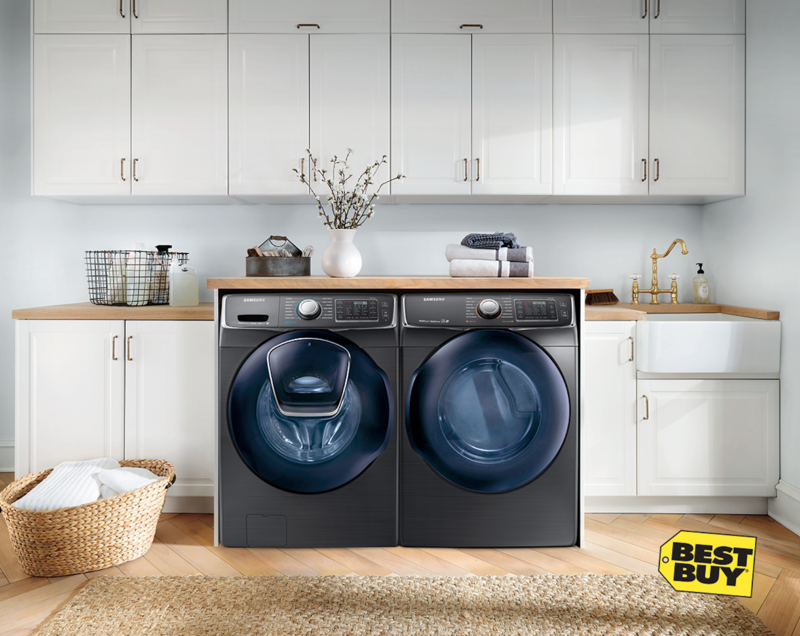 See what ENERGY STAR appliances you can find at Best Buy. Do you have ENERGY STAR washer or dryer in your home or are you looking to buying new? I want front loader so bad but my laundry space just won't allow it. Luckily there are Energy Star options for top loaders too. I look at Best Buy first for appliances too and the last washer I bought was from there and just a fantastic deal.